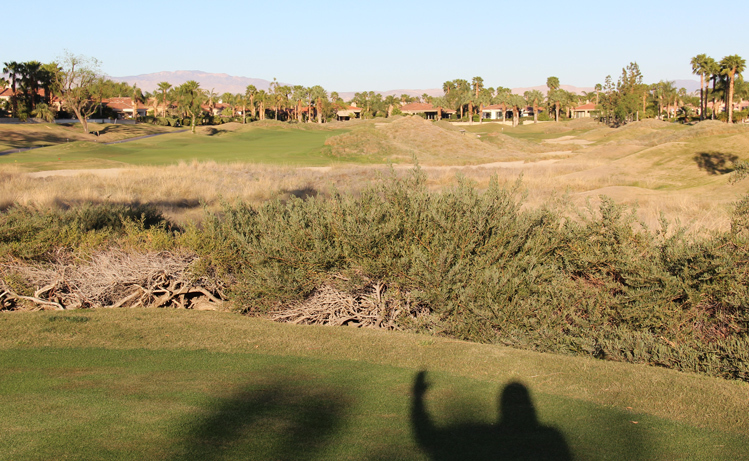 PGA West Nicklaus Private Course Hole 1: The first golf hole highlights a lot of what the golfer faces. The tee shot is not overly tight, but there is obvious trouble on both sides, with the left (in this case) being down a steep bank. The green, like so many here is angled, sloped and very tight, with misses in most directions leaving very difficult up and down propositions. 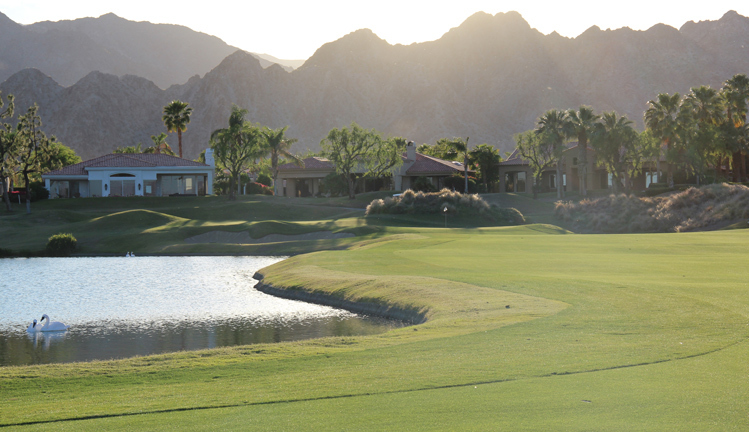 PGA West Nicklaus Private Course Hole 2: This outstanding golf hole is vintage Nicklaus design. The drive is unassuming but it can set up an easier or more difficult approach depending on its precision. The second shot is nasty, with the green set over the canal (and deep bunker) and snug up against the rocky hill. To make matters much worse, there is a massive boulder that fronts the green and makes most of it blind. If you hit that rock, trouble will ensue. The putting surface is very narrow and angles from front to back and left to right sharply. Put another way, miss right and you're in the water or bunker and miss to the left and you are in the rocks or, at best, have a chip straight down the hill. 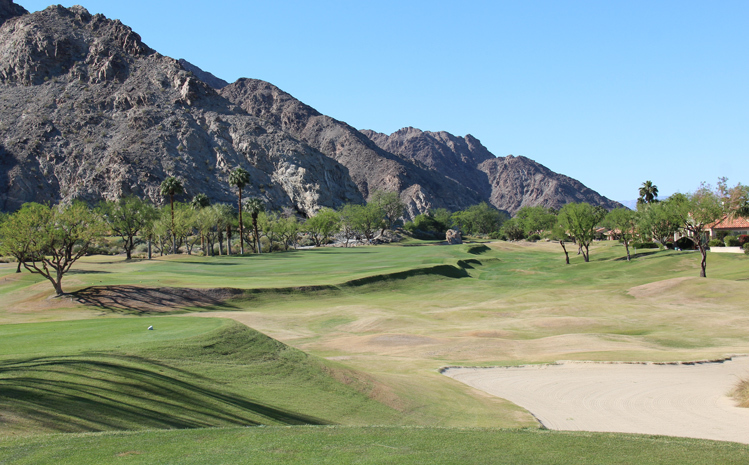 PGA West Nicklaus Private Course Hole 3: The tee box is elevated and snug up against the mountain. The green is set up against the canal and, besides the left, deep pin (next to the canal) it is not a very deep green either, so a high, soft, accurate shot is required. 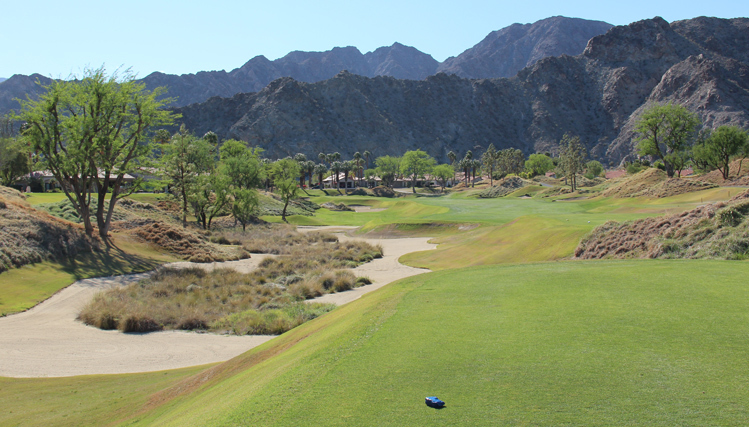 PGA West Nicklaus Private Course Hole 5: Right is very bad off the tee, but this longer par four requires a good drive followed by an accurate second to a very tough, narrow and tiered green with steep drops and/or bunkers on either side of it. 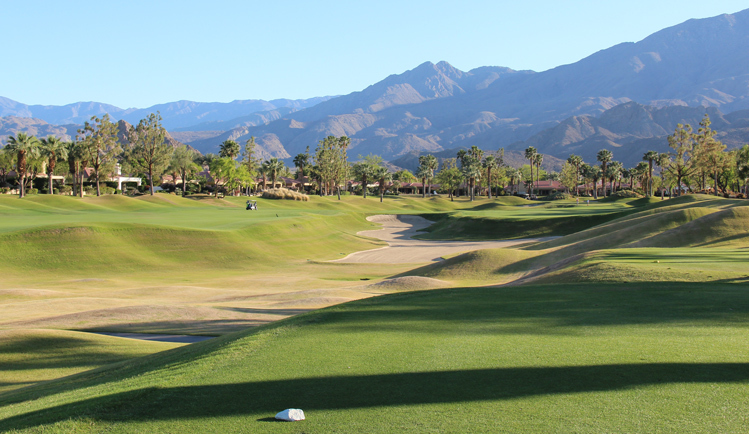 PGA West Nicklaus Private Course Hole 6: If the previous hole was hard, this one is just mean. The tee shot is tight between the water to the left and OB far to the right but the second shot is way uphill to a very shallow green. Missing short will leave an impossible shot out of a bunker, at best, or, at worst, a drop from the rocks or the water. Long or left is also no picnic with steep slopes or bushes to greet the golfer there. So, basically, a long, uphill hole with disaster facing the player on every shot and no real bailout at any time sums up the 6th. PGA West Nicklaus Private Course Hole 10: A massive bunker essentially splits this fairway and the tougher drive is to the right, but that leaves a much straighter angle to the very narrow and deep green..
PGA West Nicklaus Private Course Hole 10: A massive bunker essentially splits the fairway in two halves. The right side is harder to hit but leaves a much better angle to the very narrow and well-guarded green. 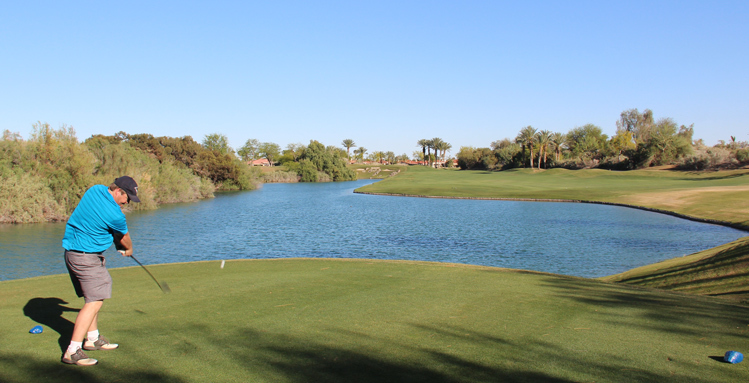 PGA West Nicklaus Private Course Hole 13: This par five is actually one of the best scoring opportunities on the difficult back nine. The drive is pretty open so it comes down to what the player wants to do from there. The layup shot is fairly accessible and the green really has the easier, short-right pins and the deeper back-left pins, with a huge tier separating them. So, if the player can find the correct section, a birdie is a real possibility. 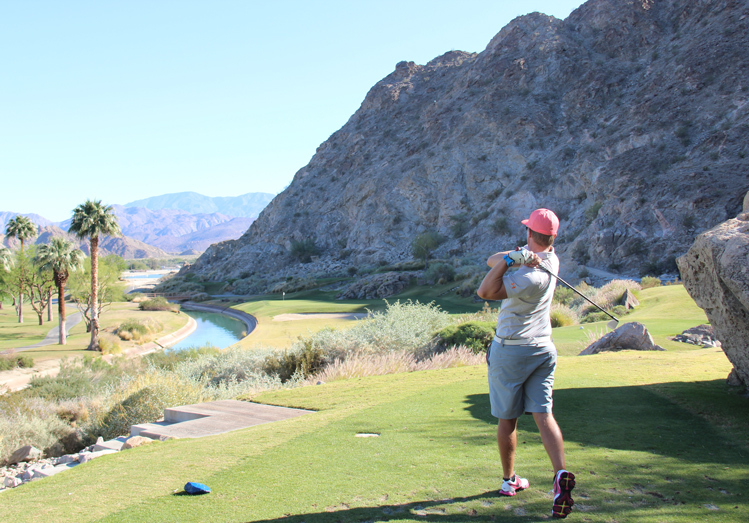 PGA West Nicklaus Course Hole 14: The tee shot here is quite beautiful, even if a bit tough. The water and the mountains in the background provide quite the vista. The second shot is also tough with the green perched at water's edge and, as usual, it is not very big. PGA West Nicklaus Private Course Hole 17: I cannot profess to like this golf hole, but it is worth mentioning as it is unique. Fairly long from most tees, the green is very shallow and is fronted by a massive mound, leaving at least half of the putting surface blind. So, as long as the golfer has a mid to long iron that they can hit very long, straight, high and soft, then this hole isn't really that unfair.